Bought it locked but door open. I’ve asked a few weeks ago if I could open the back cover of the door and safeman gave me good news. Lock is allready out of the door and I have to make a key now. Was not easy with bolt out! You can see one screw behind the bolt that gave some trouble. Any news on data of the lock and safe are welcome. 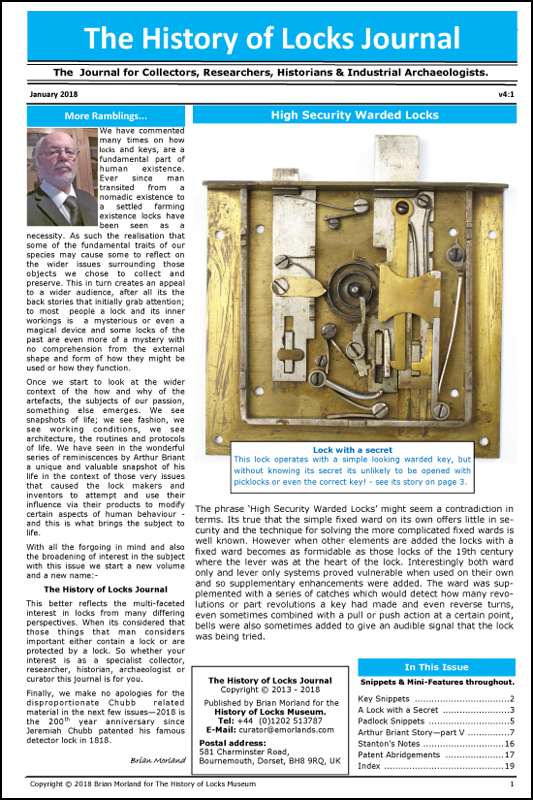 In case you are impatient, here's a little piece on the lock. the insertion of gunpowder of any effective quantity. if required, to be key-retaining. i.e. the key could only be removed if the boltwork was thrown. (to preclude leaving the key in the door through forgetfulness). I love those locks, total quality. Paintwork is in quite good nick too for the age. The whole thing is quality, and in such good condition. I do like those drop handles. A little piece of memorabilia to put into your 'inexpensive' safe. Lock is clean and I polished the levers. So it runs very smooth. Key is also ready! So job done. Only to polish the outside and I have a nice safe.